Trinidad and Tobago women’s Under-20 player Kedie Johnson, right, defends as Jamal Durant of a North Under-15 boys team shields the ball in a practice match held recently at the Hasely Crawford Stadium, Mucurapo. 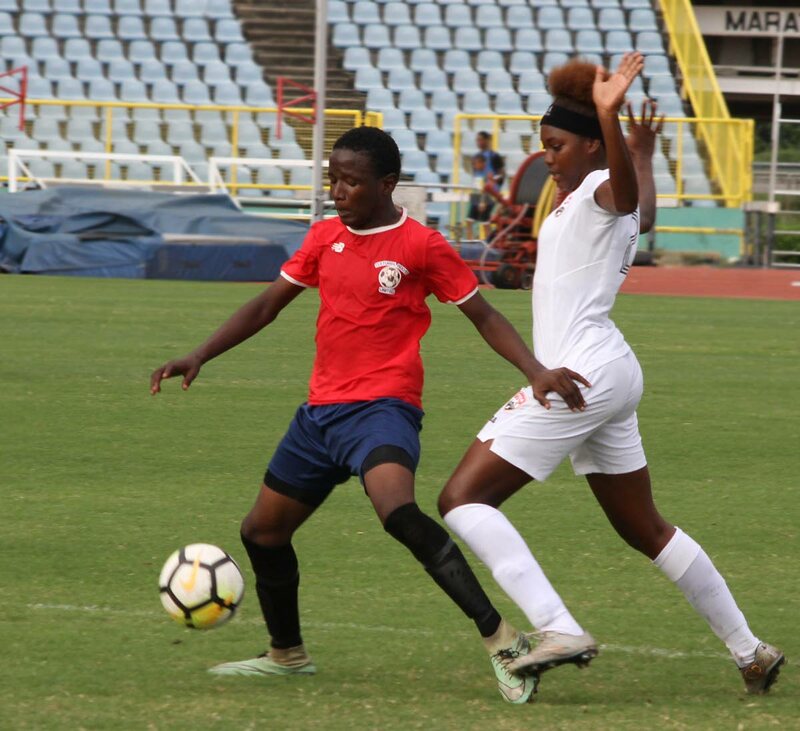 It has been a struggle for the Trinidad and Tobago women’s Under-20 football team to get quality international warm-up matches ahead of the CONCACAF Women’s Under-20 Championships, which will take place at the Ato Boldon Stadium, Couva from January 18-28. But coach Jamaal Shabazz is remaining optimistic that his team will benefit from top-level opposition before the start of the eight-team tournament. The Championships also serves as a qualifier for three teams for the 2018 FIFA Under-20 Women’s World Cup in France. This month, the TT Under-20 team played two matches against the national women’s team (losing 2-0 on both occasions) as well as one against a Northern Football Association (NFA) Under-15 boys team, which also resulted in a 2-0 defeat. TT have been placed with Haiti, Costa Rica and Canada in Group A, while Group B will feature the United States, Nicaragua, Mexico and Jamaica. Shabazz noted that it is also a struggle, from an economic standpoint, to arrange matches. He said, however, he will welcome playing an international friendly anywhere in the world. Shabazz added, “The budget in the Associations are very tight. Often times, even in the days of plenty with (ex-TTFF Special Advisor) Jack Warner, we would have had to prioritise. All the Associations in the region are faced with tight economic situation. The veteran coach said neither he nor his team is moping as they are focused on preparing as best they could for the Championships. “As much as we would like, the opportunities would not be there for a lot of friendly matches. But we’re not going to make it a problem. Currently the (TTFA) technical director Anton Corneal, myself and the staff have come up with this idea to make the senior team very competitive. Reply to "Shabazz wishes for gift of friendlies"